Well-known for his "affectious" smile, impeccable style and well-loved charisma throughout the San Francisco nightlife scene, DJ DANE MITCHELL is spreading the magic of his music and always enigmatic presence. Collaborating with well-known bay area artists such as Bjorn Niclas, Tall Sasha, DJ felNLove and others, these collaborations quickly prove to become a fast-paced musical momentum that has brought the SF/Bay Area, Las Vegas and Hawaii to new levels of excitement and delight wherever he goes. You'll find Dane spinning around the bay area at various clubs, fashion events, as well as local charity events and fundraisers. Such as playing for notable events such as "Fashion For A Cause" promoted by Charleston Pierce. Whether he is working with Bjorn Niclas, resident DJ for Ruby Skye or spinning in the internationally-known Supperclub in San Francisco, Dane Mitchell is a DJ that will take his performances and events to the next level making him the industries newest, "DJ to watch" performance artist and promoter. 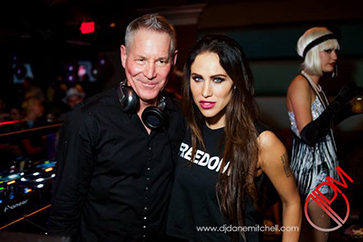 DJDM with the ever-enchanting Helena @ Slide SF. 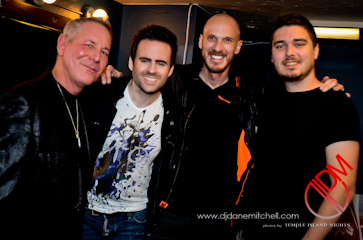 Backstage at the Warfield with Gareth Emery and Bjorn Niclas. Keep in touch. Enter your name and email address below to get on DJ Dane Mitchell's mailing list. !! 2pm to 2am !!! Release your inhibitions for a weekend of pure tropical indulgence...playing poolside by day, and partying under the stars by night. PZ welcomes you to our biggest event of the year....and outdoor sensation of sensual fantasy, libido-powered excess filled with world class dance music, titillating bikinis galore, and our signature girl-positive energy. Click flyer below for pre-sale ticket purchase via Eventvibe. Or view the Facebook Event page here. Copyright © 2014 DJ Dane Mitchell. All rights reserved.